The hassle with using multiple browsers is keeping your bookmarks organized; you end up with some bookmarks in Safari, others in Camino, and still others in OmniWeb. In the past, we’ve covered a couple ways to manage bookmarks between browsers: BookIt ($12), which lets you synchronize your bookmarks between browsers, and URL Manager Pro ($25), which provides a centralized, system-wide set of bookmarks accessible from all browsers. But a simpler—and less expensive—solution is Agile Web Solutions’ AllBookmarks ( ; free). When you launch AllBookmarks, you get a new menu-bar icon that looks, appropriately enough, like a book. Click on it, and AllBookmarks shows you a hierarchical menu of all your browsers’ bookmarks, organized by browser. (AllBookmarks currently supports Safari, Camino, Firefox, Flock, and OmniWeb; the developer says Opera will be supported in an upcoming version.) Choose a bookmark to open it in your default browser. Because you have instant access to each browser’s bookmarks, it no longer matters where you save a bookmark—which also means you no longer have to stop and think about where you saved a particular site the next time you want to visit it. AllBookmarks provides a few options for viewing its menu. You can choose which browsers’ bookmarks appear, and you can choose to show all bookmarks grouped together in the main menu instead of in browser-specific submenus. If you find that a recently-added bookmark isn’t appearing in the menu, choose the Refresh command to force AllBookmarks to update its display. AllBookmarks also has one other unique feature that users of 1Password, from the same developer, will appreciate: You can access all your 1Password bookmarks, complete with login info, from the AllBookmarks menu. What don’t I like about AllBookmarks? The biggest issue is that in my testing, it sorts bookmarks differently than they appear in each browser; I found it confusing to have one order in Safari and another in AllBookmarks. In addition, the sorting follows a logic I haven’t been able to decipher—it’s not alphabetical by link name or URL; this makes finding a particular bookmark difficult at times. There are also a couple features that would make AllBookmarks even better. The first would be if there was some way to open a bookmark in a browser other than your default browser. For example, if each bookmark opened in your default browser if you chose the bookmark itself, but offered a sub-menu for opening the bookmark in a different browser. Second, it would be useful if each browser’s history was accessible via the AllBookmarks menu, making it easy to revisit a site no matter where you last viewed it. 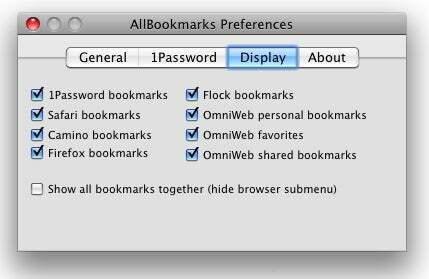 AllBookmarks 2.5.1 requires Mac OS X 10.4 (Tiger) or later.